Although we will always do our best to accommodate everyone’s needs, we recommend placing your reservations on Sundays before the week has started. As an added convenience, a regular dog-walking schedule can also be set up as a recurring reservation so your walker will always have your reservation set. You can mention this in the notes provided. We ask that you do not schedule or cancel appointments with the dog walker/pet sitters. This leads to billing errors and/or missed appointments. Business and visiting hours fall between the hours of 8 a.m. and 4 p.m. and services are usually completed during this time unless we are behind schedule. Happy Waggerz will not accept time specific calls, as we cannot guarantee specific times accurately. A one-hour window is acceptable. A cancellation notification is recommended to be made at least 12 hours prior to service. Cancellations made after 10am the day of service will still accrue a half-day charge for services. Furthermore, if we arrive at your home for a scheduled dog walk and your dog is not available or we are unable to gain access to your home, you will be charged in full for dog walking services. Regardless of what the circumstances may be our dog walkers come prepared and travel through any weather, therefore we feel their time should be respected and in doing so charge such services in full. Invoices will be emailed to you based on the payment arrangements you prefer. Happy Waggerz accepts payment biweekly. Payment must be made 14 days after receiving the invoice. Invoices that are not paid after 14 days will be charged a 5% fee each week until payment is collected. Invoices outstanding after 60 days past the due date may be subject to cancellation of services. Payment can be made by paying cash visa, mastercard, amex or by email transfer to hello@happywaggerz.com. Cheques can be made payable to Stephanie Carruthers. If paying cash please have cash in a sealed envelope with your name and invoice period clearly written on it so we can allocate it to our books. If you have paid in cash you will receive a receipt once head office receives it. Our dog-walking times include the time outside. Please make sure we have written permission to access your apartment if you live in a building or complex with a secured entrance. Also, please allow a one-hour window of time for your dog walker to arrive at your home. This will allow travel time between jobs, and ensures that we meet the needs of all our clients. Happy Waggerz will not be responsible for any keys the client has asked to be mailed. If entry to home cannot be made because of faulty keys, or keys not left at Concierge, client authorizes the use of the management to open the door. If this is not possible the walker will not be able to walk the dog and the daily walk fee will be in effect (this will only be expected when all avenues have been exhausted). Client provides a suitable towel to use in the cleaning of a dog when necessary. This towel will be left by the front door every day on which your dog is walked. The client understands that their dog walker has a limited amount of time to spend cleaning their dog on muddy days, and that their dog will not be bathed under any circumstances. Therefore, if client’s dog is extremely muddy, he/she be sectioned off in a part of my home if given permission by client. In the best interest of both your dog and the walker, 1-hour walks will not occur if there are weather advisories or strong storms with thunder and lightening. In either case we will go outside long enough for your dog to relieve themselves. In the event that something should happen to your dog that requires medical attention, we will do everything possible to obtain the right treatment for your dog in a timely manner. In the event that we are unable to reach you in a timely manner for whatever reason, we reserve the right to take your pet to the nearest veterinarian at the cost of $25 an hour. We require that all dogs be current on their Rabies, Distemper, Parvovirus, Para influenza, and Hepatitis vaccinations. Vaccinations must be administered by a licensed veterinarian a minimum of 48 hours prior to Happy Waggerz services being performed and records of vaccinations must be provided. Happy Waggerz does not accept aggressive dogs. Client agrees to be responsible for all costs (including, but not limited to, medical care, attorney fees, etc.) if client’s dog should bite another person or animal. Happy Waggerz does not walk any dogs over the age of 8 months who are not spayed or neutered. 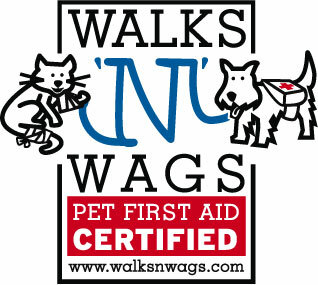 Happy Waggerz will not walk unruly or untrained dogs or dogs that choke themselves on their leash. All dogs must be walked on a leash, no exceptions. We do not walk dogs on choke chains, prong collars or any other form of aversive training collar. If you feel your dog(s) require these tools, Happy Waggerz will provide a head halter or easy walker to use during our services at no extra charge. For safety reasons, if at anytime your walker feels that the apparatus used to walk your dog with is unsafe or not secure enough, we will provide alternative gear to walk your dog. All pets need to wear proper Licensing identification. Happy Waggerz is not liable for any fines incurred if pet is not wearing such identification. Happy Waggerz Dog Walkers may photograph or video the client’s pet(s) and use these photos/recordings for marketing and promotional purposes without any liability or obligation by the client. Happy Waggerz personnel may enter client’s home for the purpose of picking up/returning their pet. We will not be held responsible for dogs that cause damage to furniture, carpet, flooring/woodwork, walls, etc. while walker is not present. Happy Waggerz cannot be responsible for any complications dogs may suffer or actions of dogs while they are unattended. Happy Waggerz and their sub contractors agree to provide services stated in this contract in a safe, reliable and trustworthy manner. In consideration of these services and as an express condition thereof, the client expressly waives any and all claims against Happy Waggerz or its sub contractors unless arising from negligence on the part of Happy Waggerz. Pet sitters are representatives of the company and have signed non- compete agreement. At no time are they allowed to solicit business from clients referred to them by the company. If they do so, or if they accept pet sitting jobs “on the side,” they are at risk of losing their jobs. This is necessary to protect the business. Any wrongful or misleading information in the Pet Information sheets may constitute a breach of terms of this Dog Walking Contract and be grounds for instant termination thereof. Occasionally, our walkers get sick or request time off. We will always let you know that your walker has requested time off and arrange for another Happy Waggerz staff to walk your dog. Unfortunately we cannot guarantee you will have the same substitute each time; however, we make sure that each substitute is prepared. All of our dog walkers are bonded and insured through the company, and will always have a copy of your dog’s profile sheet so that he or she can keep the routine consistent and give your dog a great visit. The regular cancellation and scheduling policies still apply.